With the advancement of Theros upon the Magic: the Gathering scene, I can’t help but wonder exactly how this set will affect Standard. From one perspective, the printing of the Scry Lands and the generally higher cost of most cards in the set (Bestow creatures, Legendary Enchantment Artifacts, the Devotion mechanic favoring slow but steady board development) leads me to believe that Standard is about to slow down – significantly. Hellrider was a complete beating, and losing this card will affect the speed of Standard because the more powerful cards from the next two sets in the block are not yet present. But, on the other hand, when a large block rotation is about to happen (losing the entirety of Innistrad block + M13) and players are left with limited options, you will usually find that the deck type of choice is aggro. As you can see, there were many options for an aggro (even aggro control) build at this period that were able to place very well. The theory behind why aggro does so well at the beginning of a new Standard environment is that the difficulty level is much higher when building a control deck. This is because there are many different factors a player has to consider when choosing what they want their control deck to specifically accomplish in order to win the game. In contrast, to build an aggro deck all you have to do is jam a bunch of efficient, cheap creatures into a shell and then go to town. Of course, there are always players that will play control no matter what. There are always players that can play around aggro either because of a greater skill level as a player or properly building a control deck for the metagame based on previous Block season action (see Jace, Architect of Thought rising to $15 currently). But that doesn’t mean that you can’t capitalize financially on the large amount of aggro about to hit the field! Boros Reckoner – I think that this is the most obvious card that will be included in the aggro builds for months to come. Being a HUGE devotion enabler and an amazing overall creature means that this card is due for a price increase as demand starts to catch up with dwindling Gatecrash supply. 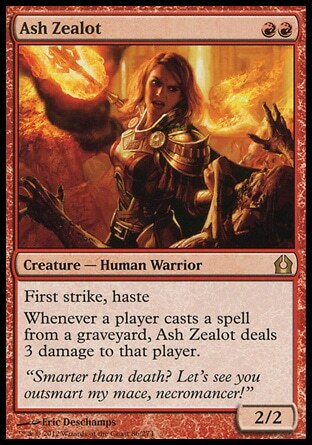 Ash Zealot – When I think of an aggro deck, I see mono red aggro being a big contender. With great options like Purphoros, God of the Forge, Burning Earth, Lightning Strike, Boros Reckoner, Stormbreath Dragon, and Mizzium Mortars, there are a lot of tools to build an unforgiving red deck that an untested format will have difficulty dealing with. There is a lot of potential for Ash Zealot in this build. Haste and first strike on a 2/2 body, which also counts a lot toward Devotion costs with a RR mana cost makes this a juicy pickup target. They are very cheap right now; most vendors will sell them for $1.50 or less and you can most likely pick them up in trades as extra throw ins. I predict that some form of mono red will be viable once Theros hits and if Ash Zealot is a part of that deck, it could easily see a $5 or greater price. Imposing Sovereign – This card was mentioned before by other financially savvy magic players when M14 was revealed, but I think now especially is a good time to pick up these guys. It fits great into the white weenie deck that is also probably going to emerge with the introduction of Theros if mono red is not your cup of tea. It’s a Goblin Piker that simultaneously punishes opponents for playing fast decks as well as makes it difficult for slower decks to block. If it sees play and does well you can expect the $2.50 price to increase. 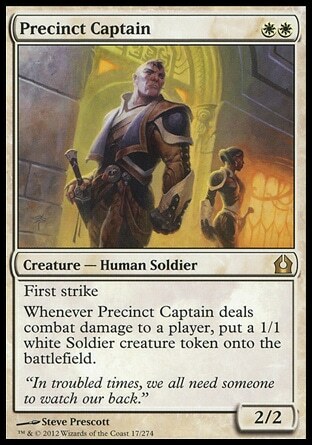 Precinct Captain – Well, here is a forgotten little gem! Where red has Ash Zealot, white has Precinct Captain to take up the two drop spot in it’s deck. The Captain was in a fair number of RTR Block decks (18% or so), and you can bet that most cards that are good in RTR Block will see play in Standard towards the beginning of block rotation because they have established themselves as solid cards. Though future strategies may negate the efficiency of a 2/2 first striker that makes 1/1’s, in the beginning everyone will want them to turn on Devotion and to keep the beats coming along with Heliod, God of the Sun. Getting in at $0.50 to $1 for these guys seems like an great pickup to me. Blood Baron Vizkopa – Though this doesn’t really fit into my article’s theme, I thought I might mention the Baron in this case because this is a card I believe is undervalued right now at $9.50. Its protection from Black (which is a color I believe will be played a ton thanks to Thoughtseize coming back into Standard) will be key, and in addition to all of its other abilities this will make the card an important strategy in control decks or as the top end of the curve or for aggro decks. At the least this will be a sideboard powerhouse. Since it is a mythic rare from an unpopular set, it will be hard to find after a while. Get in at $10 before the price increase starts to happen. Scavenging Ooze (also Mutavault, technically) – I believe that the window has pretty much passed on this opportunity, but still try to get in at $14-$15 if you can. I’ve noticed something very weird with M14 prices this time around (based on M13 and previous core sets) – the cards never really fell to the depths I thought they would after being out around a month. Even though Scavenging Ooze was preordering for $20, it never really fell below $12 if you bought them through vendors over the past month since M14’s release. Either M14 was gobbled up by players so that they could acquire Scavenging Ooze and Mutavault in oodles, or something has really changed with Magic in respect to the speculation dynamic. No longer is it quite as easy to predict the fall, and rise again, of clearly obvious format defining staples with the exception of dual lands. Even Mutavault has not fallen very far from the $15 preorders I was seeing – it still commands an average $13 price tag even though it is played at most as a 2-3 of in current decks and in only 30% of the decks if that. Of course, as more Theros spoilers are revealed it could completely negate the impact of the ooze and vault on Standard, but in my opinion strong cards are strong (in this case, even Legacy strong) and people will want to try and play them in decks even if they don’t fit quite right. As Standard continues into next year, and even the block beyond Theros, at any point Ooze and/or Mutavault could become very good. I would try and get my playset of both of these now because I really don’t see them going down in price in the foreseeable future. At the worst, Standard players now can hold onto these cards indefinitely because they will be playable in Modern and Legacy for years to come. Tidebinder Mage – This card definitely has the potential to be good because it provides a 2/2 for UU that easily turns on Devotion and can help to hold back annoying red and green creatures. 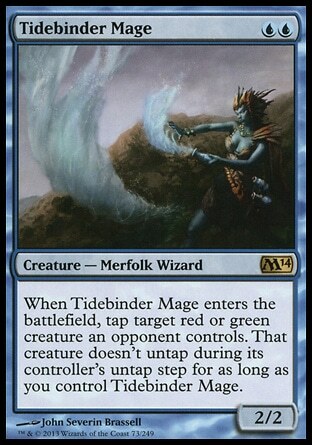 If a blue based Devotion deck comes online taking advantage of Thasa, and all those good blue Scrying creatures, I think that Tidebinder Mage could play a role in early Theros standard. For $1.50 I don’t think you can go wrong. Even if the spec doesn’t turn profitable, you can always send them to a buylist at a later point because I believe that during the next two years this Mage will at least make it into the sideboard of a deck piloted by a popular pro tour player that places well in a random Pro Tour, GP, or PTQ. Voice of Resurgence – Everyone pretty much missed the boat on this guy, but lucky for you Voice is slowly dipping back down into the $30s range of “somewhat affordable again”. You can get it for the low $30s but I think that Voice really has nowhere to go but up. G/W aggro Populate is certainly a possible deck, combining Trostani, Advent of the Wurm, Loxodon Smiter, maybe even Scion of Vitu-Ghazi (another great spec at $0.25 a piece) and this guy for some serious beats. Remember Voice is from DGM like Blood Baron, an unpopular set that was hardly even opened. There is a lot of potential for other DGM mythics or rares to spike unexpectedly, but I wouldn’t be surprised for Voice to soar to the $40s or even $50s again if G/W aggro becomes a staying Standard archetype. For the most part, any deck this thing is played will include four of them. Though I wouldn’t actively try to pick Voice up because of the high barrier to entry, if you can trade for them at $30 I would call it a satisfactory pickup. Worst case, you can unload them come January for the same $30. In conclusion, there is a lot of financial potential in the low end of Standard aggro decks. Most of them have very low buy-ins as rares, so the risk is mitigated by the fact that even if only one or two of these cards is a great card you can still make money because the cost of entry is so low on these picks. My prediction is that the Gods will make people excited about playing mono colored decks in Standard, so being able to get in early on cards like Ash Zealot for the Purphoros Devotion deck or Precinct Captain for the Heliod Devotion deck will be a good strategy. That’s all for now folks! In my next article, I will delve more deeply into Theros cards specifically because at that point more than half the set will be revealed. For much of the MTG finance world, condition is a big deal. Scales, grading, and the smallest of dents can knock significant value off of a card. However, to someone who is building a cube, or needs that last foil, or mainly plays at someone’s table on Saturdays… condition isn’t nearly as big a deal. I tell you this because if you’ve ever tried to sell/trade to a vendor or a collector, you know that they will take money off based on their grade of the card. It can be frustrating and then some, especially if you think you’ve taken good care of it. Here is a secret for dealing with most casual players: minor and sometimes major flaws in a card are not that important. I myself have a Bloodstained Mire that I bought for $15 from a retailer, because it had been bent. Undamaged ones were $30, and I had planned to get one of those, but when I put the bent card in a sleeve, the damage wasn’t easily apparent. Should I ever need to trade that Mire, I’ll be looking for someone who doesn’t care about condition, and I’ll find such a person before too long. Keep in mind that for older cards, condition is likely to be a key factor. Dual lands, pieces of Power, Alpha lands: all of these (and more) have their price affected by condition, sometimes heavily. These are 20-year-old pieces of cardboard, and very few have made it through unscathed. In case you didn’t know, we didn’t really have sleeves for cards for the first few years, and so the backs of cards will often have all sorts of dents and scratches from being turned sideways on a piece of concrete. Now, it’s true that some cards are truly damaged and unplayable. Some are so warped that they cannot be used in tournaments, and I respect anyone who won’t keep such cards. But for many players, if it looks okay-to-decent in a sleeve, there’s no problem. You won’t get as much in trade as you would an undamaged card, but you’ll get more than you expect. In some cases, people won’t ask for less at all. If they do care about the condition, and want to knock a little off the value, you should probably accept that it is indeed worth less (but not worthless!). If they want to grade the card in front of you, then it’s probably time to move on. This is especially true with foils. I’ve met players who really wanted the effect a foil gets if it’s been played without a sleeve and there’s an edge of silver around the card, from where the black ink on the border has worn off. I’ve met others who don’t want that effect at all, and wanted a lot less than the card was worth. When you’re trading online, then you’re in a much trickier area. I’ve had multiple experiences where cards arrived in a different condition than I expected, and I’ve had people say I sent Slightly Played cards instead of the Near Mint I promised them. My advice in this regard is to be open and honest. Communication is everything. If there’s a chance of a problem, scans are good, pictures are good. On eBay, I’ve heard tales of someone who sold a card at NM price, but the buyer then claimed that the card was SP. So the buyer sent the card back, and indeed, it was a SP that got sent back. This is an evil, criminal tactic to upgrade the condition of a card and a reason why you need to be diligent with feedback. I’m told eBay always takes the buyer’s side, so be appropriately cautious. Be cautious as well when you’re dealing with signed cards. Most vendors view that as a negative, even though many casual players will view a signed card as more unique and personalized. I like my signed cards, as they represent a journey of different artists I have met and events I have been to. So if you have a slightly worn yet very awesome card, don’t despair. Just be patient. A vendor may not give you full value for it, but there are many trade partners who are looking for that exact card. You’ll find them, make the trade, and everyone wins. 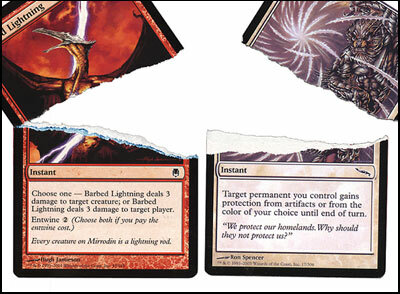 As Theros nears, it’s almost time for another visit to the Banned and Restricted list. Updates to the Banned and Restricted (B&R) list are responsible for some of the fastest and most severe price changes in Magic finance. It occurs at a very specific time (midnight) on a very specific site (dailymtg) amidst the cacophony of the F5 key being mashed by devoted mages everywhere. The changes have immediate impacts. There’s no need to spend time considering how a card influences a metagame; when a card is unbanned it simply skyrockets in price. Whether it will be any good at all or not is completely irrelevant. Midnight at the B&R corral is entirely a “shoot first and ask questions later” scenario. Today we’ll look at reasonable candidates for removal from the list, and the consequences of those cards being unbanned. If I don’t reference a card, it’s because I don’t consider the likelihood of it being unbanned at this time enough to warrant discussion. One last thing – Jace isn’t getting unbanned. Don’t ask about it. Wild Nacatl – Wizards originally cited a concern that Nacatl reduces diversity by eventually forcing all green-based aggressive strategies to be quite similar. Well, a great deal has changed since then, and the result is that we have basically no green aggro/zoo at this point. At this point the soup du jour for getting into the red zone is Robots. There’s been a little RG Aggro that pops up now and then, but it’s a fringe player at best. 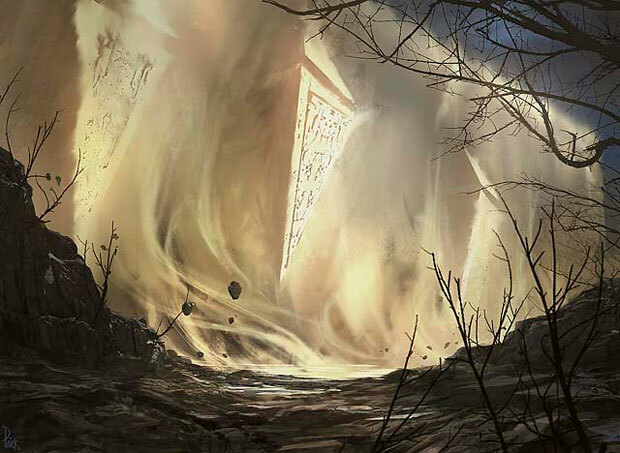 Wild Nacatl would have the chance to put green-based aggressive decks back on the map again and help temper the significant amount of combo roaming the Modern landscape. Wild Nacatl will be unique on this list in that she herself will not vary much in price if she is allowed back into Modern. As a common, there isn’t much room for growth. The pack foils and promo will see a slight uptick at best. Additionally, looking back at old Zoo lists before she was banned there appears to be very few rares in those lists that aren’t still seeing solid play, so none of her old cronies are poised to see a huge upswing if she returns. As best as I can tell, the biggest winner if Wild Nacatl is unbanned is Domri Rade. He’s already showing up in Modern, and Nacatl would cement him as a legitimate contender in the format. 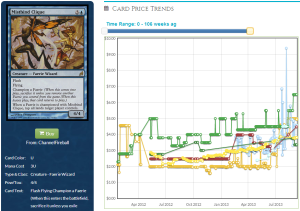 Domri is starting to push $25 already, and could easily end up the best Planeswalker in standard. Nacatl pushing him harder in Modern could send him into the $30-$35+ range pretty easily. Unfortunately, as speculators it’s tough to put so much capital into a card with a profit margin of around $5. You’ll want to own a playset, but I wouldn’t go much deeper than that. 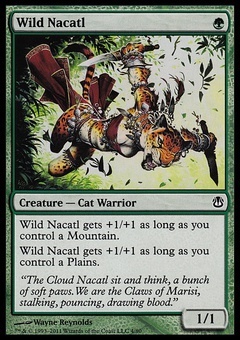 Honestly, beyond Domri, I’m not sure what else is a hot pickup if Nacatl is unbanned. I’d love to hear your suggestions in the comments of a card I’m overlooking that isn’t already justifying its price tag. Bitterblossom – I’m no fan of the fae myself, but I recognize that Bitterblossom would unquestionably give rise to a new (old) contender. It’s assuredly a riskier choice than Nacatl, and may end up proving to be too much, but given the relative diversity of Modern right now Wizards may be willing to try adding a little spice. Enabling fae would certainly help reign in the combo decks a bit, just as Nacatl would. Where is the money to be made with a Bitterblossom unbanning? The non-promo itself is already $15-20, so like Domri, even if it rises in price we’re unlikely to see our investment even double. 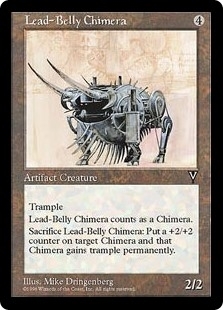 Obtaining a playset of these if you’re interested in the deck is safe, but hardly lucrative. Vendilion Clique is already obscenely priced, so that’s not particularly a good spec target. Our best bet would be a rare that is seeing no play at all right now, but would be a major player in fae. My choice for this role is Mistblind Clique. Due to the champion trigger, she’s unplayable without a critical mass of faeries, but in a Bitterblossom deck, champion may as well be advantageous. As a 4/4 Time Walk that gets even sillier with Restoration Angel, a card that faeries would probably want anyways, Mistbind is fertile ground at only $3. What makes this particularly safe is that it’s been a long time since we’ve seen Mistbind do anything in a real format and she’s still $3, so that appears to be her real floor for the time being, meaning you can’t lose much on an investment. If Bitterblossom gets unbanned, Mistbind could easily break $10, and $20 isn’t inconceivable. Interesting note: good luck finding foils of this card. As of this writing, TCG has 0, SCG has 1 SP JP, ABU has 1 NM and 1 SP, and eBay has 1 JP. Earthcraft – I’m not sure this card actually does anything in Legacy, which makes it a great card to remove from the B&R list. I think we are well beyond the point that a 2-3 card combo that requires a basic land would have any meaningful impact in that format. If it’s unbanned it will double or triple in price, but then what? A viable competitive deck will almost undoubtedly fail to materialize, so after an initial jump it will spend months dwindling down. Make sure that if you’re holding any when/if this is unbanned, you sell into the hype immediately. Memory Jar – Many are aware that this card has the honor of being the only one in Magic history to be emergency banned. However, that was in Urza’s Legacy, and Tolarian Academy was in the set prior. Yes, Memory Jar draws you 7 cards. It also costs 5 mana. Would it be unbelievably broken? Unlikely. It would certainly be riskier than a card like Earthcraft but that doesn’t preclude Wizards from finding out. 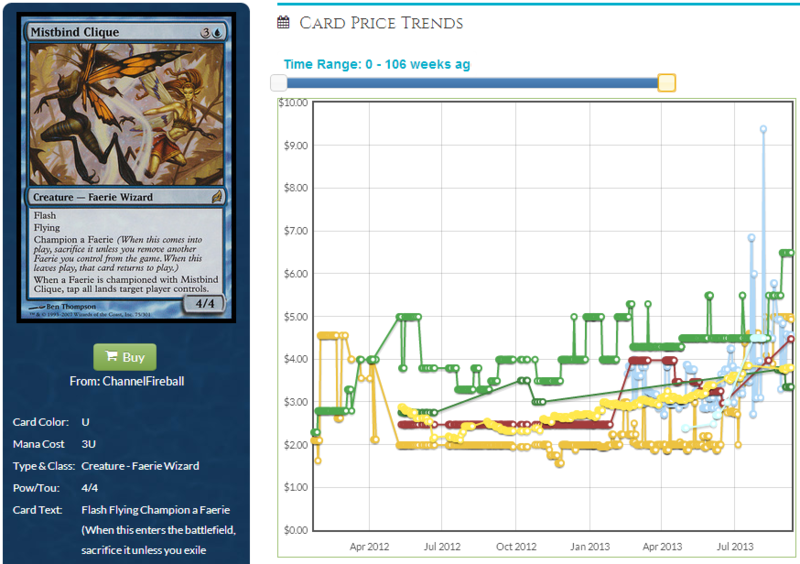 Memory Jar itself would be the biggest beneficiary of it being unbanned, easily surpassing $15-$20. Mind Twist – By the time you’re casting this in a way that makes it better than Hymn, it’s taking your entire hand to do it. Sure your opponent has no cards left, but neither do you, except for maybe a City of Traitors or a Grim Monolith. And that is the best case scenario. Mind Twist is a relatively safe unban, and most Legacy enthusiasts agree. The financial impact would be very similar to Earthcraft. We’d see prices severely increase ($8-20), but when it fails to put up results, it will slowly tick down. Again, sell into the hype immediately. Mind’s Desire – This is my favorite card on this list for a few reasons. First of all, the judge promo is phenomenal looking. Second, I simply think the card is cool when viewed through a kitchen table lens. Third, the card is comfortably under $1. If Mind’s Desire is unbanned, $15 each seems easy, as any Desire deck would want four. This card is super cheap to get in on, and has a gigantic upside. Before the comments fill up with people exclaiming this card is buh-roken, consider it relative to Ad Nauseam. Mind’s Desire needs 6 mana, 2 of which are blue, and a healthy storm count. Ad Nauseam needs 5 mana, 2 of which are black. The biggest point in Mind’s Desire’s favor is that a single FoW won’t stop it as it will Ad Nauseam. Given the extra work you have to do in order to cast the card however, that doesn’t seem unreasonable. Mystical Tutor – This was banned on considerably dubious grounds due to Reanimator, and that deck is hardly crushing Legacy. We have a good idea of what the format looks like with it back, so it’s not a complete unknown in the same way something like Memory Jar would be. The biggest threat with this card is probably Show and Tell. if Mystical Tutor is unbanned, it may be the straw that breaks the camel’s back in regards to getting S&T banned. Around $4-$5, the upside on this is probably about double. Not only was it in FTV, It was uncommon in both Mirage and 6th Edition, which has a very real impact on the quantity available. I would be picking these up in trades for cheap if possible, but I probably wouldn’t put much cash directly into them. Tolarian Academy – One of the most feared lands of all time and the frosty harbinger of combo winter. 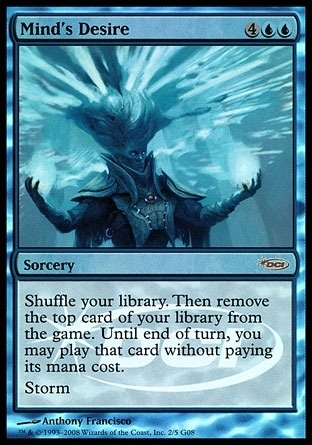 There is little consideration given to why this is banned; a simple “It’s Tolarian Academy” will suffice. However, this article by Carsten Kotter from last year has a great explanation of why the card is probably (mostly) fair. It’s certainly a few levels above Earthcraft, but it’s entirely possible it isn’t a Survival of the Fittest. Financially? Gaea’s Cradle is ~$130. The sky’s the limit. Worldgorger Dragon – Worldgorger sets up an infinite loop with something like Animate Dead, so you get infinite mana and infinite ETB triggers. In order to accomplish this however, you need to get Worldgorger into your graveyard, reanimate it with Animate Dead, and dodge your opponent having counterspells, creature removal, or graveyard removal. At that point, isn’t Griselbrand or Jin-Gitaxis just better? Like Mind’s Desire, he’s comfortably under $1 which leaves a huge amount of room to grow, regardless of performance. Immediately sell any and all copies into the hype. I mentioned it briefly before, but this article by Carsten is a great look at the Banned and Restricted list. There are a lot of cards on those lists that we just assume are there for a good reason, but haven’t truly considered in quite some time. It’s a fun read. Stormbreath Dragon is the real deal. Did you notice that Pat Chapin’s article today (premium required) over on SCG had him in nearly every single deck that made red mana? Nimbus Maze has been confirmed to not be in Theros, so sorry if you wasted $40 on a foil playset like I did. There was a post on Reddit about Savageborn Hydra being a decent spec target. I definitely agree. While it’s not guaranteed he jumps while in Standard, the precedent is there to at least double your money by the time he rotates.